Outperformance Indices measure the performance of one index relative to another. These indices amount to the ratios of the spot prices of the underlying markets multiplied by 1000. For instance, let’s say that you’d like to place a trade on the German vs the French Index. In this case, the German vs French Index measures the performance of the German Index in relation to the French Index. This outperformance index rises if the German Index performs better than the French Index, and decreases if the French Index performs better than the German Index. Rise/Fall trades of 15 minutes up to 1 hour may be purchased on any of the 4 new Outperformance Indices: the German vs Dutch Index, the German vs French Index, the German vs Swiss Index and the German vs UK Index. 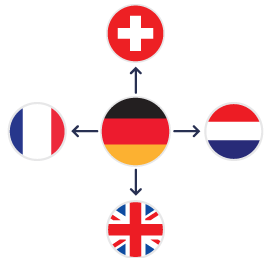 The German Index vs Swiss Index and the German vs UK Index are also available with a minimum duration of 5 ticks. Check out our new outperformance indices now!